The Search for the Wyeth Nutrition Kid Innovators grand finals was held recently with students were given recognition for outstanding science projects. 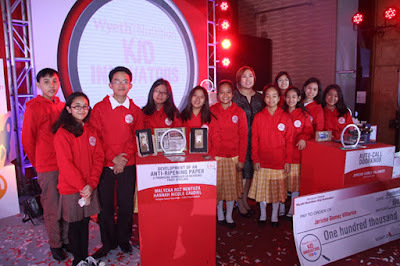 The awarding was held at the Crowne Plaza Manila Galleria in Ortigas Center. Three top teams were given the awards. Philippine Science High School – Central Visayas Campus was represented by Malycka C. Rentuza and Hannah Nicole Gadiel. Their development of the Anti-Ripening Paper benefits the fruit industry wherein the paper retards the progress of accelerated fruit ripening thereby prolonging the shelf life of the fruits. This will be a boon farmers and those entrepreneurs who sell fruits. The paper is also much cheaper than commercial anti-ripening chemicals that are currently used. The Baguio City High School team was represented by Jercicho Gomez Villarico with the Auto-Call Doorknob. The device aims to reduce the incidence of burglaries since the automated doorknob will alert the homeowner to any attempt at opening the door when it is locked. The invention also automatically takes a photo of the potential intruder thus, giving evidence to investigators. St. Scholastica’s entry was the Banana Stem Water Filtration and Distillation System. This was developed by Katrina Ysabel Sison, Adrianne A. Ong and Samantha V. Estrella. The filtration system is an alternative to the present filtration systems and is deemed ecologically friendly. It is a four-level filtration system that cleans water of microbials, impure substances and even unpleasant odors. Wyeth Nutrition aims to inspire the youth in developing and innovating new products and processes. These in turn will give impetus to the youth in using scientific and technological ingenuity in addressing the needs that are present in everyday situations.